Classic donabe is always versatile. You can do table top hot pot, or you can make a one-pot braising/ stew. 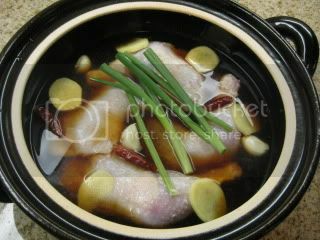 For this dish, I used my classic Iga-yaki donabe, "Ame-yu". 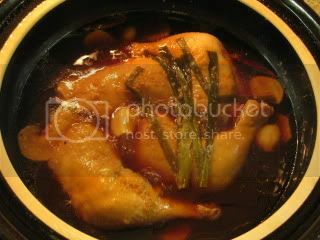 This donabe's body is large and deep enough to cook generous amount of braising dish for a group, so I like using it when I cook large pieces of meat. 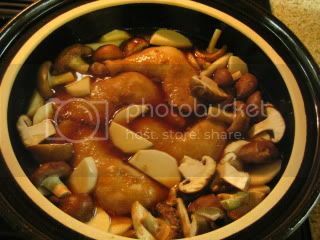 I got some chicken legs from McCall’s Meat & Fish, and braised in soy sauce & black vinegar based broth with kabu (Japanese turnip) and shiitake mushrooms. 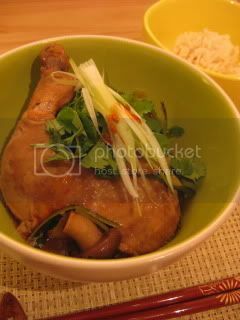 This dish is so easy to make, as you just need to assemble the ingredients in donabe and set over the gas stove. Because donabe does the very efficient slow cooking, once you put the ingredients in donabe, you basically just let the donabe do the rest of the work. How easy and delicious the dish is! 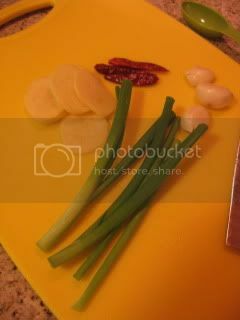 Aromatics for the dish…scallion (green part), garlic, ginger, and dry hot chili. 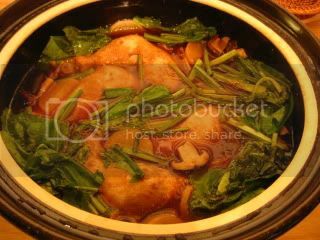 Chicken and aromatics were added to the cooking liquid (water, sake, raw brown sugar, soy sauce, black vinegar), then braised for about 25 minutes on gas stove. 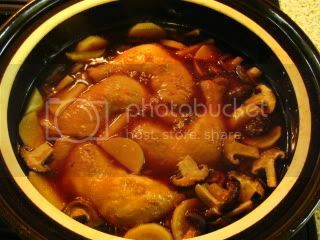 Aromatics were removed and kabu and shiitake mushrooms were added and simmered for additional 15 minutes. 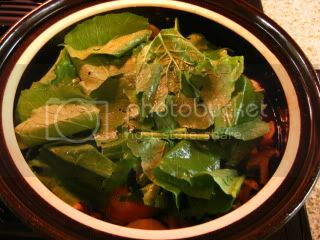 Leaves of kabu were added. 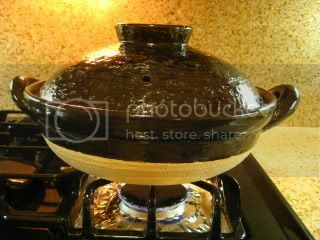 Donabe was removed from the heat and rested for 15 minutes. The dish came out gorgeous! Chicken was so juicy-tender, and tasted great with the sauce. Vinegar added the key complexity to the sauce (the sauce never tastes “vinegary”). Jason said he wanted to baithe in this sauce. I posted the recipe on toiro’s website. So, please check it out.